This is a story about a young man, who along with his six crew members of similar age, volunteered for the RAF during World War 2 and endured the hardships of war and prison camps. Edward A. Robbins, known as Ted was born in Wormley, Hertfordshire on the 26th of February 1923. Aged 9 months he moved with his family to Vancouver in Canada. Like most young boys he built model aircraft using balsa wood. Wood craft was to remain with him throughout his life. Living near an aerodrome, which is now called Vancouver International, he watched planes, dreaming that one day he would be a pilot. Between flying, Ted learnt the theory of flight, engines, meteorology, navigation and signals. After flying various trainer planes, Ted obtained his Silver American Wings on the 3rd of July 1942 at the Army Air Force Advanced Flying School at Craig Field, Alabama. In October 1942, he was posted to Bomber Command’s, No 19 OTU (Operational Training Unit) at Kinloss on the Moray Firth in the north of Scotland. Ted, now a sergeant, crewed up with four other sergeants, a navigator, a wireless operator, a bomb aimer who was also qualified to take over the controls if the pilot was killed or badly injured and a rear gunner. After a period of day flying training on the twin-engine Armstrong Whitworth Whitley bomber they switched to night flying exercises. At 16.45 hrs on a dark blustery night on the 9th of December 1942, the crew took off in their Whitley on a night cross country bombing exercise. This was to be a good test for the inexperienced crew. Shortly after take-off the port engine caught fire and had to be shut down. With the loss of power, caused by this dead engine, the wheels and flaps were unable to lower. The weather conditions had now worsened with snow flurries and strong cross winds, Ted turned for home and was then able to show his skill by making a safe belly landing, at 17.10 hrs, on the grass alongside the runway. A few hours later the crew were airborne again in another Whitley. This is the RAF’s way of proving that they hadn’t lost their nerves. On completion of the OTU course and a spot of Christmas leave, Ted and his crew were posted to the newly formed No 1661 HCU (Heavy Conversion Unit) at Winthorpe, 3 miles from Newark in Nottinghamshire. The course, which lasted six weeks, was to convert crews to fly the twin-engine Avro Manchester and the four-engine Avro Lancaster bombers ready for operational duty. These bombers required a crew of seven, so Ted was joined by two sergeants, a flight engineer and a mid-upper gunner. With an instructor, their first flight together was in a Manchester, which after several hours familiarization they were able to proceed to fly a Lancaster. In Ted’s off time periods he and a colleague visited Newark Baptist Church. After the service they would stop in the church canteen for light refreshments. There, Ted met Joan, a young lady who later was to become his wife. The training at Winthorpe continued at a rapid pace. Daily, they flew gaining confidence and gelling together as a team. At 11.20 hrs on the 21st of February 1943, with thick clouds and torrential rain, Ted and his crew set off on a simulated bombing raid, with eight sand-filled 1,000lb bombs, on the Ruhr in Germany. They had been briefed to drop bombs on various practice ranges on the Welsh coast, turn towards Southwold in Suffolk, Newquay in Cornwall, and Penrose on the Isle of Wight and then return to base. All was going well. At Southwold with the sun shining at a height of 20,000 feet there was an air of contentment. Over Reading west of London, now at 19,000 feet, there was a loud explosion. The plane went into a spin. Ted and his flight engineer fought to bring the plane under control. After losing several thousand feet in height they managed to get the plane level and could then assess the damage. The starboard inner engine had lost its cowling and the leading edge had disappeared. No one could understand how this had happened. Various ideas were suggested. The radio operator, using Morse code, sent a SOS with their position back to base at Winthorpe. Winthorpe control advised Ted to land at an emergency airfield at Manston in Kent. Losing height very quickly, Ted knew he couldn’t make Manston and turned south towards the sea. Dumping the remaining bombs, he decided to ditch the Lancaster. With the undercarriage down and the crew in their crash positions, the Lancaster splashed down, a few miles off Portland Bill in the English Channel. The Lancaster broke into three pieces but the crew were all safe. The dingy was inflated and they all climb in completely dry, except the mid-upper gunner who had jumped into the sea. After a struggle he was pulled into the dingy. 2½ minutes later the Lancaster sank. In March 1943, after completion of the HCU course, Ted and his crew were posted to No 106 Squadron at Syerston, near Newark. This was to be fortuitous as he was only 6 miles away from visiting Joan. Their first operation, as a crew, was on the night of the 28th of March. Along with over 300 hundred aircraft, a mixture of Avro Lancasters, Armstrong Wellingtons, Handley Page Halifaxes, Short Stirlings and de Havilland Mosquitoes, was to St. Nazaire in France. St. Nazaire, on the Atlantic coast, was of a strategic importance. It was the base of the U-boat pens of the German Navy. This was to be the first of Ted’s 16 night operations in a period of two months. During this period some of his targets were at Dortmund, Duisberg, Düsseldorf, Essen, Heligoland and Stettin. Along with 518 aircraft a mixture of Lancasters, Wellingtons, Halifaxes and Mosquitoes Ted took off, at 21.50 hrs on the 27th of May 1943, to bomb the armaments factory of Krupps at Essen. Essen was a regular target for Bomber Command. This strategic five-month long bombing campaign was known as the 'Battle of the Ruhr,' and ran from March to July 1943. Krupps was heavily defended, twice he had been there, so he knew what to expect. Flying through flak towards the target the Lancaster was heavily damaged. Releasing the bombs on target and with both port engines out of action the plane did a death dive. Control was eventually taken. The crippled Lancaster, shaking severely, now had a drag problem as her bomb doors were unable to close. Added to this the Lancaster was being pulled starboard by the two starboard engines. Surprisingly the crew were unscathed. The plane was now slowly losing height so everything that could be removed, even the guns, was thrown out to lighten the load. 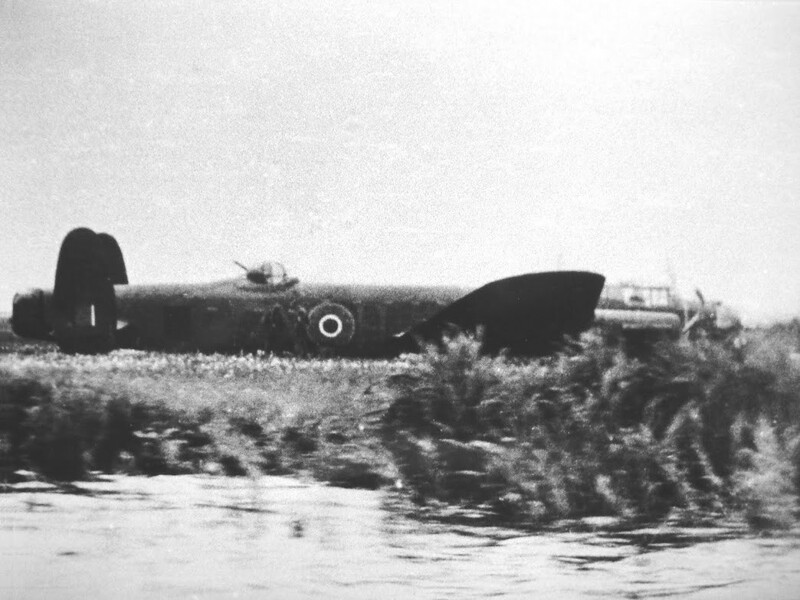 The crippled Lancaster, whose starboard engines now working overtime, slowly made its way through German air space into Holland. Electing not to bail out, the crew stayed, then one of the starboard engines burst into flames and had to be shut down. The Lancaster suffered more flak damage when passing over Amsterdam. This was taking all Ted’s strength to keep the now single-engine bomber airborne and on the straight and level. Narrowly missing a windmill and a church steeple, Ted made a successful soft belly landing on muddy water, which at first thought was to be the English Channel, slid over a dyke and coming to rest in a barley field. 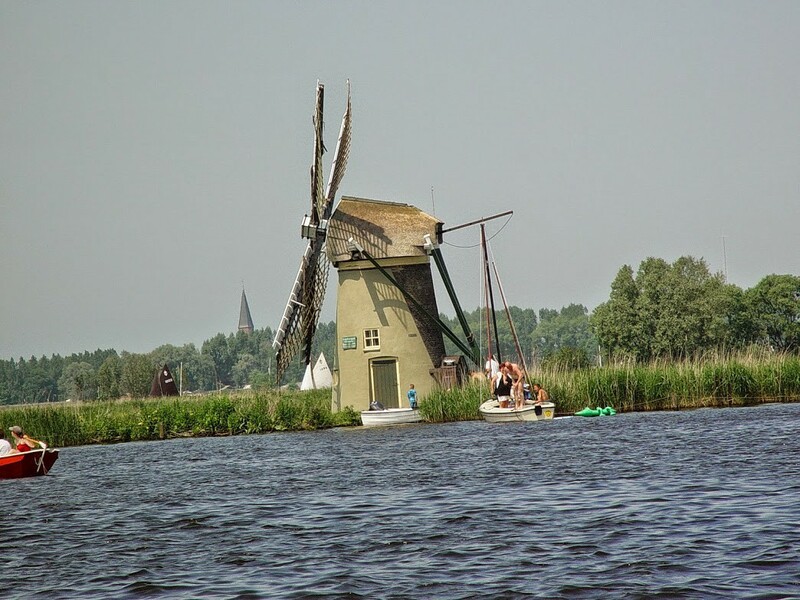 They had in fact landed on a long narrow island called Lakerpolder near Sassenheim, five kilometres (3 miles) north of Leiden in Holland. The time was 01.59 hrs on the 28th of May. The crew were elated to be alive and uninjured. This was once again down to the exceptional skill of their skipper. Unable to set fire and destroy the holed Lancaster, which resembled a colander; they split into two groups and set off walking, believing that they were on the Dutch coast. Ted’s group hid aboard a boat, where they were given a little bread and water passed through the porthole by some local people. As it was the weekend they had to get off the boat because the owners would be coming to use it. They hid for a night under an upturn boat in a boatyard. The owner of the boatyard betrayed them. The resistance fighters were on their way to rescue them, but were too late. For the boatyard owner’s action after the war he was imprisoned, and once released was deprived of his voting rights and shunned by the local people. He moved away as a result. Once in captivity they discovered that the other group had been picked up earlier. Following interrogation at Amsterdam jail, Ted’s crew were initially unable to recognise him because of the treatment he endured for obeying orders and revealing only his name, rank and serial number. They then ended the war at the prisoner-of-war (POW) camps Stalag Luft VI (Heydekrug) and then Stalag XI-B (Fallingbostel), where in both camps conditions were harsh. The Nazi concentration camp of Bergen-Belson was 19 miles away from Fallingbostel. In March 1945, with the advancing Russians closing in on Stalag XI-B, the German prison guards marched the POW's out of the camp westwards towards the British and American armies. The Germans were terrified of the Russians. They thought they would be treated better if captured by the British army. Carrying what little supplies they had, the POW's were forced-marched, in columns for about 60 miles through cold atrocious weather of rain and snow. During the march the columns were mistakenly strafed by RAF fighter planes, killing several POW’s. The German guards then ran away leaving the POW’s, who were later found by the advancing British troops. On the 16th of April 1945 Fallingbostel was liberated by the British army. On the 8th of May 1945 (VE Day) Ted was flown home by a Dakota. After a period of leave, Ted now a W.O. (Warrant Officer) rejoined No 106 Squadron. Ted and Joan were married at Newark Baptist Church on the 20th of June 1946. Ted, taking his new bride with him, went to serve in Swansea and West Malling in Kent. Ted loved flying but the opportunities to fly became less frequent, so after three years he resigned from the RAF. Ted, then rejoined Enfield Rolling Mills at Brimsdown in Middlesex and became a Sales Representative in Birmingham, a job which he disliked. The boss and owner of the factory, the Hon. John Grimston (soon to be the Earl of Verulam) then said he should spend time in all the various departments, both office and factory, and eventually he became the manager of the Sheet Mill. The whole firm was sold years later to a Birmingham firm and four years before Ted was due to retire they closed the site down and just kept their Birmingham factory. Ted said he would try to get another job, but if not they would retire to Newark or nearby. Ted accompanied Mr. Van Hage to Warmond in Holland to buy some plants for the Van Hage Garden Centre. Ted was able to show the locals where he had hidden before being betrayed and taken prisoner by the Germans. Later Mrs. Van Hage asked him to be her assistant. He spent a deal of time helping her until he eventually retired in 1986. Ted and Joan then came to settle in Winthorpe, fulfilling a promise he made that when he retired they would move back to the Newark area. On the weekend of the 31st of May 2003 Ted and Joan were invited to Warmond for the 60th Celebration of the crash and the survival of the church and windmill. They also received the Freedom of Town. Ted died on the 27th of April 2015. Following Ted’s cremation, his ashes were scattered on the old Winthorpe airfield, where the Newark Air Museum is now situated. This is a remarkable story of a young man, who by his skill, strength and determination, on three separate occasions, crash landed his damaged bomber with the crew surviving. Peter Foden describes Ted in July’s edition of Focal Point, the village magazine for Winthorpe, Langford and Holme. I offer my sincere thanks to the following for their help. Joan, Ted’s, wife, for allowing me to write the story. Sally, Ted’s, daughter, for answering my questions and queries. Mike Smith, curator of Newark Air Museum, for supplying me with information about Ted. I had known Ted since 1995 when he and I joined the newly formed Winthorpe Garden Club. I found him to be a quite reserved type of person with a soft pleasant Canadian accent. A gentleman. During the dark days of World War 2, the uncertain British weather and ever present threat of the German Luftwaffe meant that the skies over the UK were no place for eager young men to learn to fly. To overcome these problems the British Government sought to establish Aircrew Training Schemes in a number of locations both within, and outside, the British Empire (Commonwealth). The United States of America was one of the locations identified and negotiations commenced to enable British Airmen to undertake flying training in the (then) neutral USA. The negotiations were successful, and a number of schemes were established, amongst them the Arnold Scheme named after its instigator General “Hap” Arnold. The Station Commanding Officer can enter into a pilot's log book endorsements with regards to the loss of his aeroplane. These endorsements are written in either red or green ink. ‘Red’ endorsements were made in a pilot’s log book if an accident was found to be caused by a pilot. For example: neglecting to keep an eye on his fuel running out and having to force land. ‘Green’ endorsements would be made if a pilot dealt with a situation well. For example: an engine failure caused by technical failure, and the pilot then making a forced landing in difficult terrain, saving the aircraft from serious damage and himself. Ted received the following ‘Green’ endorsement – regarding ditching of his Lancaster R5892 in the English Channel on the 21st of February 1943. Sgt. Robbins was the pilot of a Lancaster aircraft detailed to do a cross-country carrying a full war load. Whilst flying at 19,000 feet near Reading there was a loud explosion and the leading edge between the fuselage and the starboard inner engine and the cowlings of the same engine were blown off. A large hole also appeared in the mainplane behind the starboard inner engine. Unable to maintain height the pilot set course out to sea and breaking cloud at 600 ft made a successful ditching near Weymouth, stalling onto the water at 150 mph I.A.S. (indicated airspeed) The correct distress and ditching procedure were carried out and all members of the crew were uninjured. Sgt Robbins remained calm throughout and showed remarkable skill and judgement. This is an insert taken from the Operations Record Book of RAF Station Winthorpe. Sgt. E.A. Robbins while on an X country landed on the sea off the Isle of Wight – leading edge of the port wing blown off by explosion. All the crew rescued. At 19,000ft an engine caught fire followed by an explosion which blew off the wing leading edge between the fuselage and the inner starboard engine followed by the loss of the engine rear cowling. The pilot ditched Lancaster R5892 five miles off St Albans Head, Dorset. NB. Text in italics are explanatory notes. The Goldfish Club is a worldwide association of people who have escaped an aircraft by parachuting into the water, or whose aircraft crashed in the water, and whose lives were saved by a life jacket, inflatable dinghy, or similar device. The Goldfish Club badge shows a white-winged goldfish flying over two symbolic blue waves. The main aim of the club is to keep alive the spirit of comradeship arising from the mutual experience of members surviving, ‘coming down in the drink’. Due to wartime regulations, production of metallic-embroidered badges was prohibited and all cloth was severely rationed. These problems were overcome with silk embroidery substituted for wire upon black cloth cut from old evening dress suits that were sent by readers of the London Daily Express after an appeal by columnist William Hickey. Uniform dress regulations prohibited the wearing of the Goldfish Club badge on British uniforms. 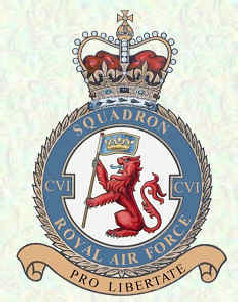 The badge was generally worn by many RAF aircrews under the flap of their left hand uniform pocket. Ted received two Goldfish awards. The first award was a cloth badge, when on the 21st of February 1943 he survived a ditching in the English Channel. The second award was a bar to be sewn onto his badge. Once again this was for surviving a ditching on the 28th of May 1943 in Lakerpolder, Holland. 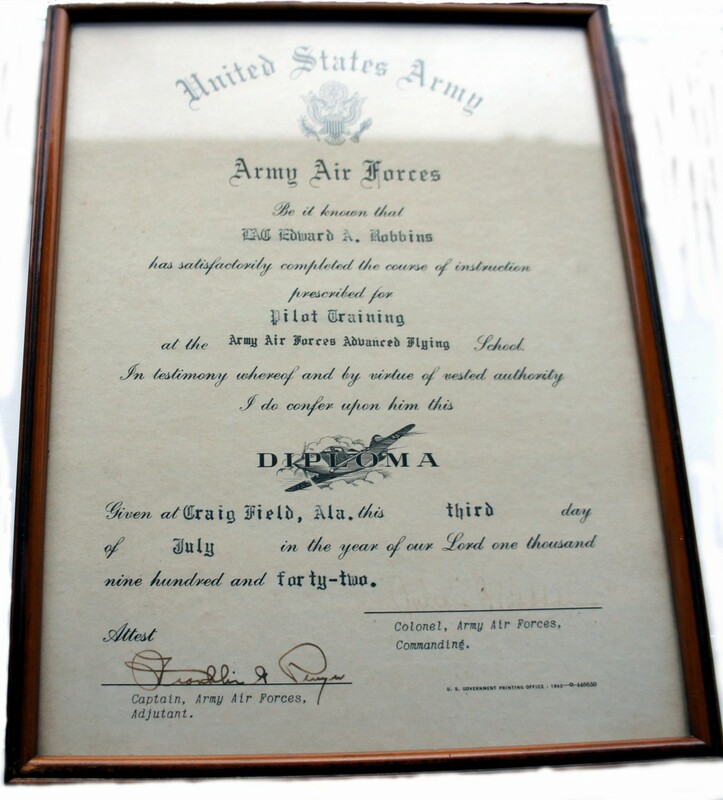 This commendation took the form of a drawing when on the 18/19 of April 1943 he successfully bombed his target at Spezia in Italy. It is known by the family as ‘The Good Boy’ picture. 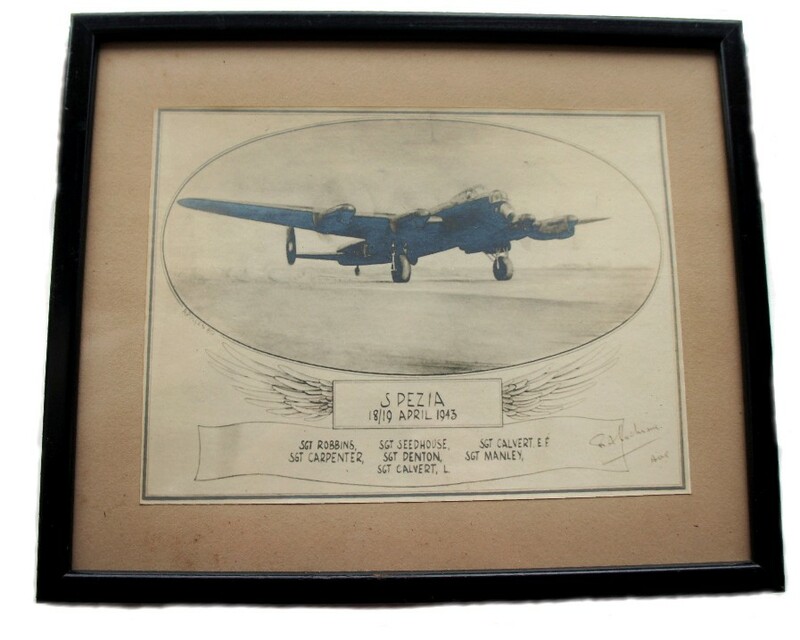 This framed drawing along with his Pilot Training Diploma hangs in Ted’s lounge. Sgt. E.A. Robbins - Captain. Sgt. J. Seedhouse - Flight Engineer. Sgt. 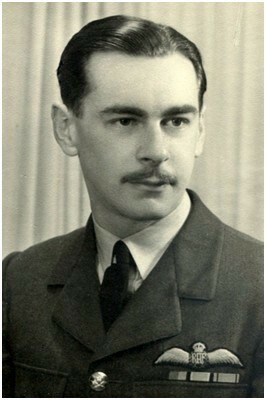 G.F. Calvert - Wireless Operator. Sgt. L.C. Carpenter - Navigator. Sgt. J.M. Denton - Rear Gunner. Sgt. B.M. Manley - Mid-upper Gunner. Sgt. 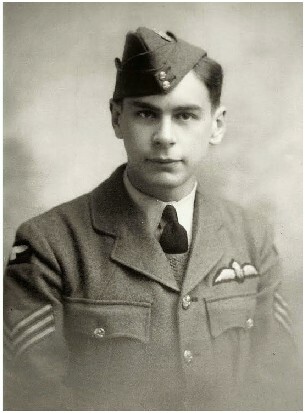 L. Calvert - Bomb Aimer. On that fateful night of the 28th May 1943, Ted’s Mid-upper Gunner, Sgt. B.M. Manley was unable to take part in the operation to Essen as he had a throat infection. His place was taken by Sgt. H. Taylor. The aircraft had completed 37 bombing missions. 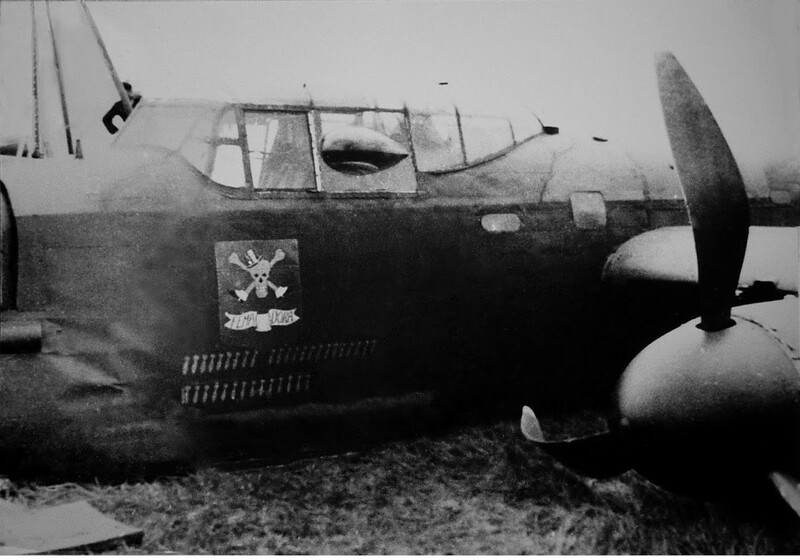 This is shown by the number of bomb silhouettes painted on the aircraft’s nose. A bomber pilot is always known as captain. When flying, he is called skipper even by crew members who may be senior to him. In 2013, Ted was awarded the new Bomber Command Clasp. This was to be worn on the ribbon of his 1939-1945 Star. He thought it was an insult and late. The Ministry of Defence refused to award a medal. During the Second World War, 147 aircraft failed to return or crashed in the UK from RAF Syerston: four Avro Manchesters, five Handley Page Hampdens, 14 Vickers Wellingtons and 124 Avro Lancasters. Bomber Command suffered the highest casualty rate of the British Armed Forces in the Second World War, losing 55,573 aircrew of the 125,000 who served. 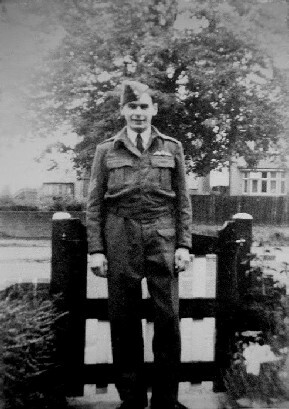 received his wings, Alabama, USA - 1942.
parents house, Cheshunt, Herts - 1942. W.O. Edward A. Robbins - 1946. L.A.C. Edward A. Robbins Flying Diploma - 3rd July 1942. 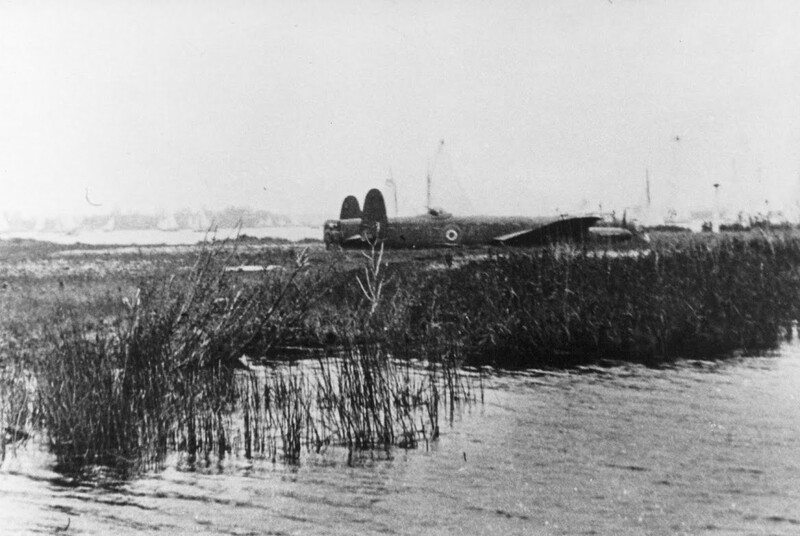 Spezia, Ital;y - 18/19 April 1943.
on the island called Lakerpolder near Sassenheim, Holland - May 1943. Ted Robbins ditched Lancaster W4842 'Fema Dora' - May 1943. Ted Robbins ditched Lancaster W4842 'Fema Dora'. Notice the artwork - 'Fema Dora' and the 37 bombing missions - May 1943. 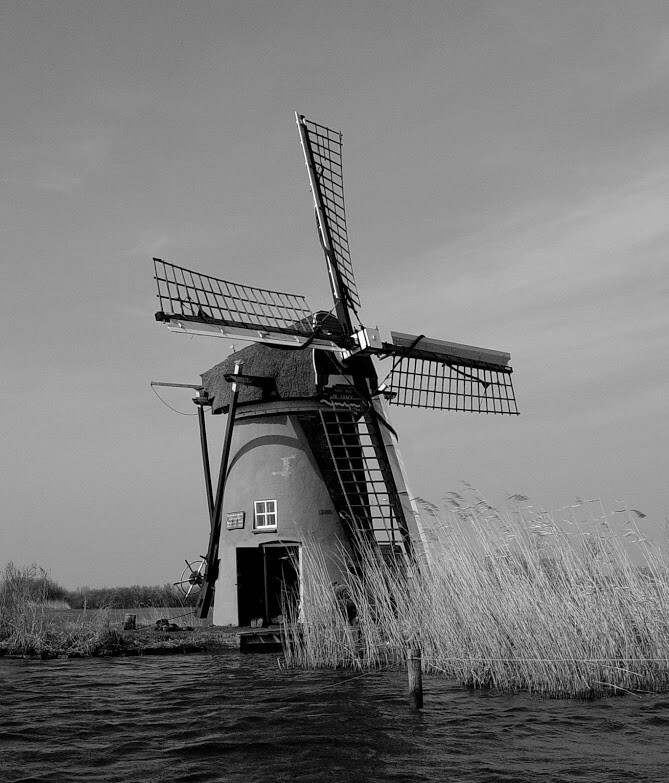 The windmill on Lakerpolder near Sassenheim, Holland, which Ted narrowly missed when he crash-landed, on the 28th of May 1943, his Lancaster W4842 'Fema Dora' - May 1943. 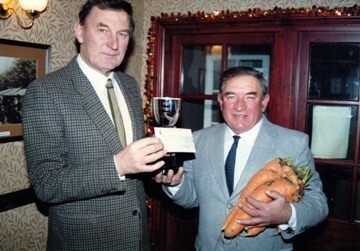 Mr. Cornelius Van Hage, owner of Van Hage Garden Centre, presenting the Winners Cup for the best carrots - 1991. Photograph - Courtesy of the Van Hage family. 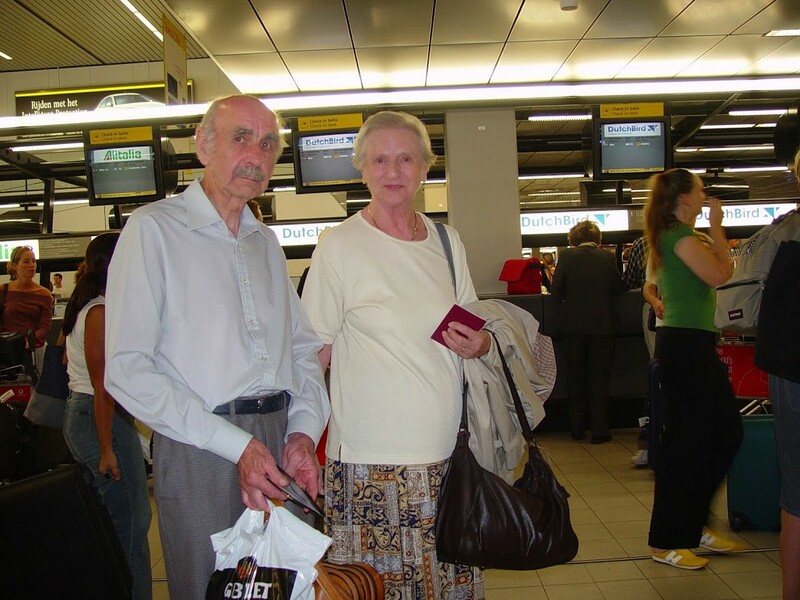 Ted & Joan Robbins arriving in Holland for the 60th Anniversary Celebrations - 28th May 2003. The windmill on Lakerpolder - May 2003. 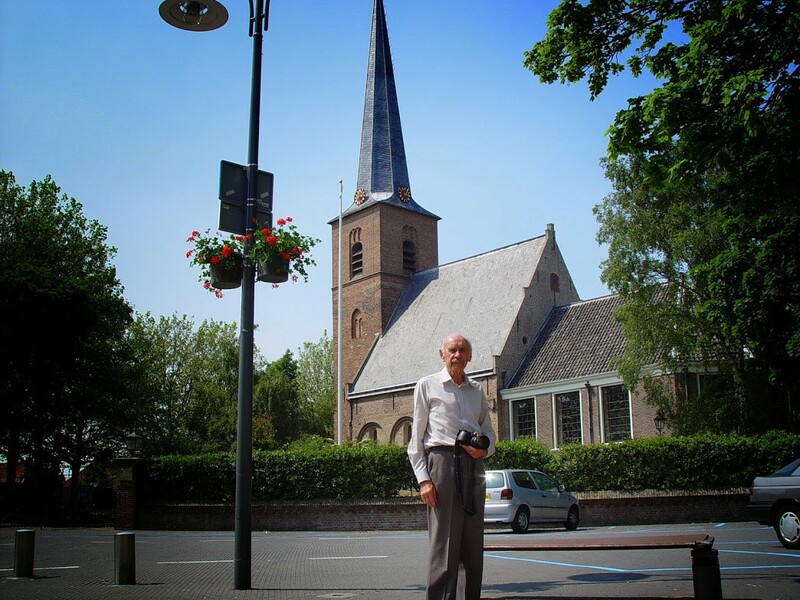 Ted Robbins in front of the church that he narrowly missed when he crash-landed, on the 28th of May 1943, his Lancaster W4842 'Fema Dora' - May 2003. W. O. Edward A. Robbins ribbons and medals. 1939-1945 Star with th Bomber Command clasp. Pro Libertate - For Freedom.